The Magic that IS MegaCon starts Friday--Artist Michael Golden Conjures Badge for the Event! Orlando-- Disney and Universal will still be there on Monday, but the magic that is MegaCon, comes together like a spellbinding oasis for only three beautiful days a year. And it's starting this Friday! In addition, artist Michael Golden will also be making a return to MegaCon after several years, and is looking forward to the experience himself. "I always feel this family run show combines the best of pop culture with a large focus on comics and illustrators" he said. "A well orchestrated mix. That continues to grow every year. They are doing it right." Adding to that mix this year will be Golden's own artwork that will be featured on badges for guests, special groups and retailers at the show. The piece features Loki and Spidey, but with the volume of Golden iconic pieces out there, it was hard to focus on just one. Michael is renowned for his ground breaking art and storytelling on such books as "Doctor Strange," G.I. Joe," "The 'Nam," "Avengers," "Bucky O'Hare" "Spartan X" and far too much to mention in a short press release. His class on storytelling is sought after by universities and colleges worldwide, while his artwork has recently been exhibited in places as diverse as New York, Barcelona, China, Antwerp and Gijon, with Lifetime Achievement Awards from the Lille Festival and the University of Maryland Eastern Shore. Joining Michael Golden at MegaCon are Batman artist Steve Scott (also represented by Eva Ink Artist Group), as well as stellar celebrities and artists including William Shatner, Jonathan Frakes, Mira Furlan, Erin Gray, James Marsters, Kevin Sorbo, Stan Lee, J. Scott Campbell, Frank Cho, Amanda Conner, Darwyn Cooke, Greg Horn, Joe Jusko, Dave Johnson, Ron Marz, Terry Moore, Phil Noto, Jimmy Palmiotti, George Perez, Tim Sale, Roy Thomas, Alex Saviuk, Tim Townsend, Billy Tucci, Arthur Suydam, Ethan Van Sciver, Mark Waid, Renee Witterstaetter, Jim Valentino, and many more! Michael Golden and Steve Scott are scheduled for panels throughout the weekend. In addition, the artists will be at the event all three days in artist alley with writer Renee Witterstaetter, signing books, sketching and offering show exclusive prints and books. Including Michael's sketchbook "Michael Golden: MORE Heroes and Villains," and Renee's new children's book "Kerry and the Scary Things." So get in on the magic while the conjuring is in full swing for these three unique and wonderful days! Gammill, Ramos and Wilson to Appear at SXSW! Austin--Three artists will be appearing at the South by Southwest Film Festival in Austin, Texas at the Wizard World Booth this weekend, by special arrange with Wizard and Eva Ink Artist Group.... all bringing a little taste of sequential art to the popular music/film event, that is fast becoming a multi-media mecca. "SXSW is quickly growing to be one of the most important festivals in the US, and each year there is more growth in fanning out to include other types of entertainment," said Renee Witterstaetter of Eva Ink. "I'm really thrilled that our artists will be appearing at this years show in this promotion with the folks at Wizard World." On hand sketching, signing books, and offering their own unique merchandise will be legendary penciler Kerry Gammill, trendsetting artist and inker Rodney Ramos (recently featured with an exclusive Buffy print at Wizard Miami), and "Hammerlocke" creator Keith Wilson. Kerry Gammill is renowned for work on such books as POWERMAN AND IRON FIST, MARVEL TEAM-UP, INDIANA JONES and the X-Men spin-off FALLEN ANGELS. His work has also been seen in FANTASTIC FOUR, UNCANNY X-MEN, STAR WARS, SPECTACULAR SPIDER-MAN, DEADLY FOES OF SPIDER-MAN, SAVAGE SWORD OF CONAN, WONDER MAN and DOCTOR STRANGE, and at DC Comics as the regular penciler on SUPERMAN, ACTION COMICS, ADVENTURES OF SUPERMAN, SUPERGIRL and two graphic novels, SUPERMAN FOR THE EARTH and SUPERMAN: UNDER A YELLOW SUN, as well as many Superman covers and trading cards. Other work for DC included TEEN TITANS, POWER-GIRL, ELVIRA'S HOUSE OF MYSTERY, HAWK AND DOVE and others. The 1990's found Gammill also working as a conceptual artist for film, providing designs or storyboards for many sci-fi movies and TV shows including VIRUS, PHANTOMS, SPECIES II, THE OUTER LIMITS, STARGATE SG1, DREAMCATCHER, ALIEN VS. PREDATOR, TREMORS - THE SERIES, G.I.JOE: VALOR VS. VENOM and the video game AREA 51. His book, "KERRY GAMMILL'S MONSTERS AND HEROES FOR FILM AND COMICS" published by Vanguard Productions is now in it's third printing. Gammill also compiled an award-winning book on the art of legendary monster magazine cover artist Basil Gogos which was published in 2006. Gammill recently joined the team behind Monsterverse Entertainment. Their first comic is the critically acclaimed horror anthology, BELA LUGOSI'S TALES FROM THE GRAVE, for which Gammill is editor-in-chief. Other recent works include cover illustrations for KEEP WATCHING THE SKIES (a massive book on 1950s sci-fi movies) and FAMOUS MONSTERS OF FILMLAND magazine. 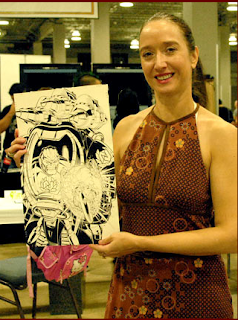 Rodney Ramos has been a professional penciler / inker in the comic book industry for over 15 years. He has worked at Marvel Comics, Marvel .U.K, DC Comics, Valiant, Acclaim comics, Malibu and Continuity Comics with Neal Adams. His inks have graced many titles such as SPIDER-MAN, X-MEN, IRON-MAN, PETER PARKER, BATMAN, WONDER WOMAN, and the critically acclaimed TRANSMETROPOLITAN with Warren Ellis and Darick Robertson. Recently he has worked for DC Comics on 52, COUNTDOWN, GREEN LANTERN, BATMAN, JSA, MAGOG, Vertigo's BANG TANGO and too many to name! 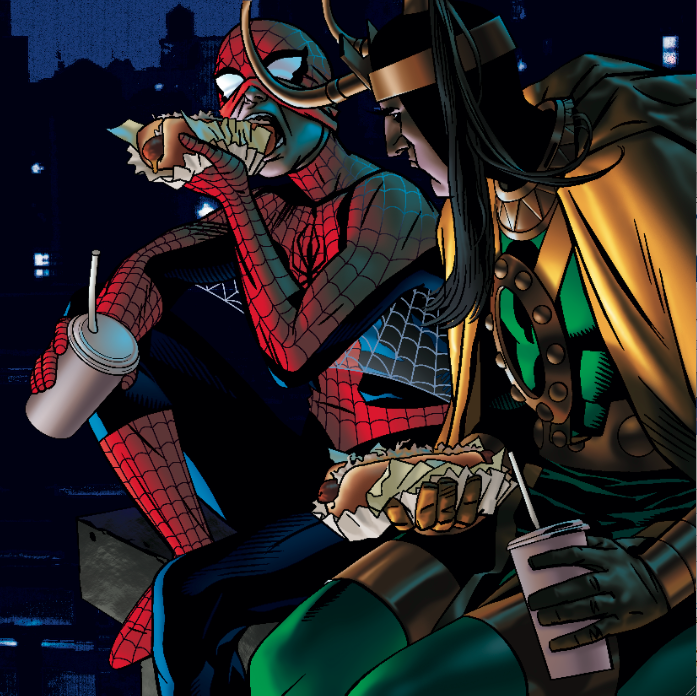 As a comic book illustrator and writer Keith Wilson has worked for Marvel, DC, Harris and many more. He co-created (with Tom Joyner) two comic series: HAMMERLOCKE (Science Fiction adventure) and SCARLETT (a complex tale of vampires) both published by DC Comics. As an animator, his feature film credits include SPACE JAM, QUEST FOR CAMELOT, THE KING AND I, and the television pilot for KING OF THE HILL. During the mid 80's Keith was Assistant Art Director and Cover Editor for DC Comics, and was responsible for production and the overall look of the covers for the regularly published comic line. He's also had the privilege of working with animation legend Chuck Jones as illustrator for three trading card sets in the popular COMIC BALL series from Upper Deck that featured the Looney Tunes characters teamed with popular sports figures like Michael Jordan. 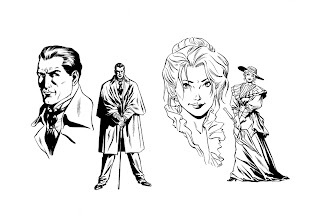 Currently he's teamed with comics legend Kerry Gammill and co-editor Sam Park to create BELA LUGOSI'S TALES FROM THE GRAVE from Monsterverse Entertainment. Come out and see these amazing creators. Rodney Ramos will be at SXSW March 11-13th, all hours of the show. 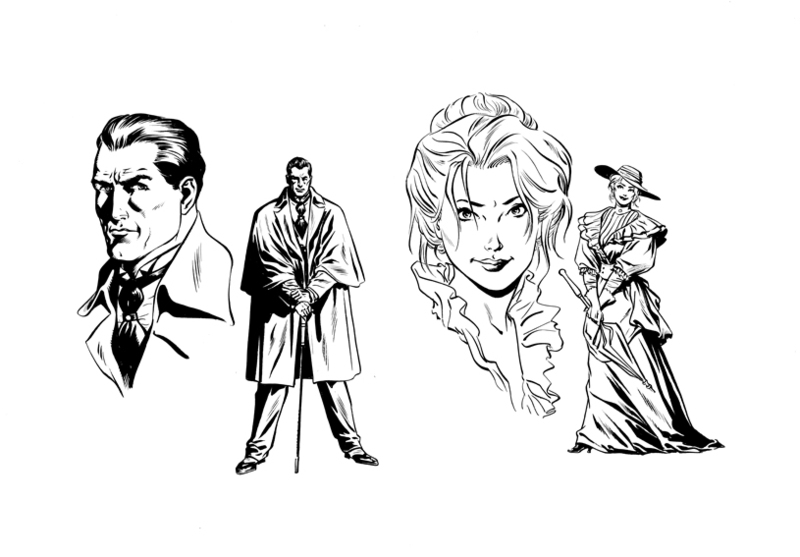 Keith Wilson and Kerry Gammill will be at the show March 12-13th. www.sxsw.com and check it out. Once there, The Wizard World Booth, Kerry, Keith and Rodney will be located at Stands 315-317 and 414-416 in the ScreenBurn Arcade Exhibitors area. 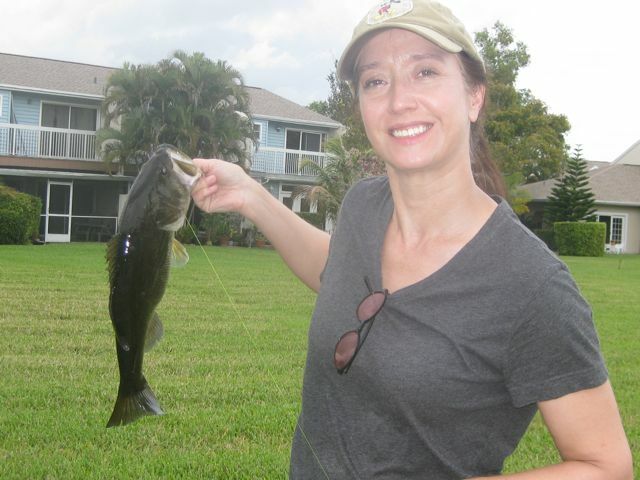 Well, being the avid anglers that we are, from the moment we first saw the episode of "River Monsters" and fishing in the Florida canals, it's been on the list of "things to do." Wizard World Miami, gave the perfect opportunity and excuse for a little fishing R n' R, and directly after the show, the next stop was Lauderdale-by-the-Sea... and you guessed it-- prime Snakehead fishing territory. All of Broward County is known for the evasive species. And opinions are mixed. Some say they are killing the native fish and competing for food, others say they have very little impact on the environment. There doesn't seem to be any debate however on one fact: They are excellent eating! That's why they are in this part of Florida to begin with. Apparently some enterprising folks had some corralled in the C-14 Canal to raise as food. 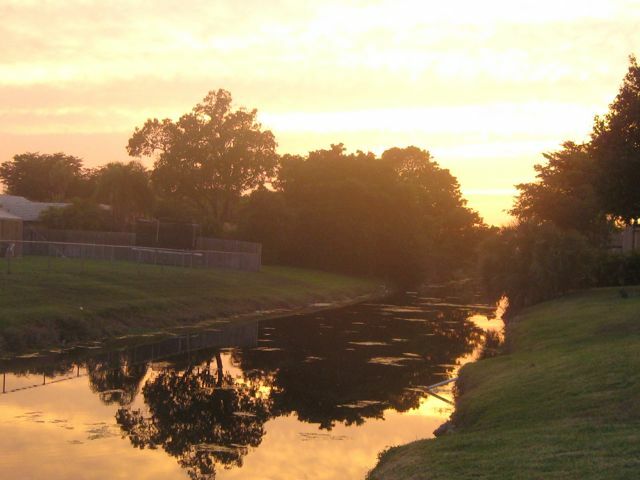 Hurricane Andrew came along and set 'em free, and before you knew it, the C-14 and all canals connected to it have been pioneered by Snakeheads. Another undeniable fact: They are excellent fighting fish when hooked. It was that appeal that had us looking for these monster fish. What we didn't realize is just how hard they are to catch, especially during spawning season, which sadly, we happened to hit. Where was the fish of legend with the body of reptile (thus the name) and razor sharp teeth! It was time to call in an expert, and after a bit of research on line, I found Captain Shane, who explained EVERYTHING we were doing wrong! First of all, Snakeheads live RIGHT along the shore. I mean RIGHT there. They love the muck and the mud and the sawgrass. They burrow into the river banks practically and set up their homes there. Being very territorial, they'll lash out at anything that invades their area. So, Hint #1: Cast as close to the shore as possible. This leads to many a frog landing on the ground first, but as Captain Shane says, just pop it back into the water. Looks natural that way anyway. But that's not all. Snakeheads are very skittish fish. If they see you, they'll disappear and you'll never see them again. Darn those fish have good eyesight. Numerous times we accidentally walked up on a few, they see us, and skedaddle. So, Hint #2: Always cast in front of you. Way in front of you. Cast into an area before you walk into it. And, as a side note. If a Snakehed takes your line. Secure that hook quickly. Once it strikes at your bait once. A Snakehead, unlike a bass, will not strike again. So, Hint #3: If you don't secure the hook and you lose your fish, just keep moving. The trick to Snakehead fishing is to keep moving, moving, moving. In fact, after 8 hours out with Captain Shane, I felt like I'd run a marathon. Stepping into a pile of fire ants in my sandals didn't help either. But hey, it happens. This is obstacle course, commando fishing. All in all at the end of the day, there were Snakeheads to be had. And the rumors are true. They are amazing fighting fish. 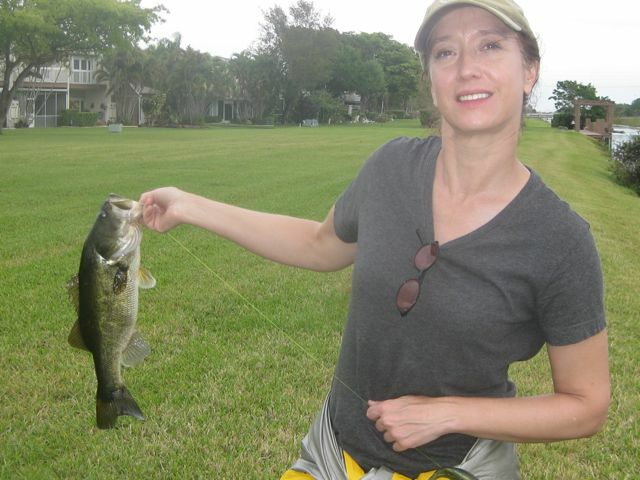 And just to round things out, a bass or two as well-- on those we did catch and release. It's illegal they say to throw the Snakesheads back into the canals, but part of me wonders if the Captain didn't just want to take it home for dinner, and if they taste that good, who can blame him. :-) His wife called several times just to see if we'd caught anything, LOL. So, that's my Florida fishing report. Now that I know the secrets of catching the elusive Snakehead, I'll be back again. 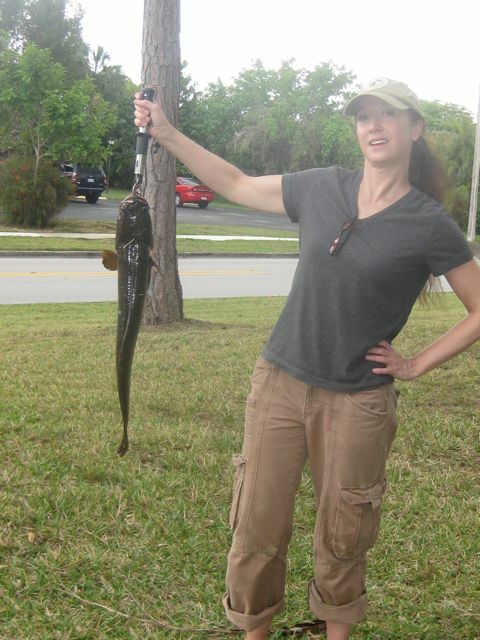 At one point, I had three gigantic Snakeheads on my line. One SO large it snapped the line and took the bait... yeah... I'll be back. Besides, the sunsets are beautiful. Now Up: Michael Golden Wizard Miami Interview! While at Wizard Miami, Michael Golden did this comprehensive interview, now available for listening online. Thanks to Steve for the great questions. This is one of the best interviews I've heard in awhile. :-) If you are a fan of Micronauts, ExoSquad or Jurassic Park, or heck, Michael Golden, give it a gander. It's full o'comic book history. "IT'S THE 25TH PODCASTALYPSE! And it's more exciting than being on an airplane flown by a velociraptor without a pilot's license because Michael Golden's here and he's got some stories to tell. It's a Prometheus Pit full of fun as the King of the Acroyears recounts what it's like being a respected superhero artist while also being known as that guy who worked on all those licensed toy books. It's one of the most experienced storytellers of our time discussing the difference between art and craft and what happens when commercialism usurps artistic integrity. Are the Star Wars prequels as bad as the critics say? Was Star Wars #38 about being obsessed with Star Wars? And what REALLY happened to those Micronaut and GI Joe action figure "production samples" they gave him? Find out all that and more in this "I KEPT THE JET!" edition of the podcastalypse! Humongous thanks to Michael Golden for allowing me this interview during WizardWorld Miami 2011 and making my 25th episode something really special. Definitely go check out his panels on storytelling during the WizardWorld Convention Tour-the one in Miami was a highlight of the show for me. You can keep up with Michael at his Facebook page and stay on top of his upcoming convention appearances at EvaInkArtistGroup.com. His next convention is Wizard World Toronto March 18-20th then it's back to Florida for MegaCon March 25-27th!" Hi Ya'll-- As a kid, I spent all my summers in New Orleans with my Aunt Margaret-- the best Cajun and Creole cook that ever lived. I attest to the fact of my remembrances of etouffee, jambalaya, gumbo and piles of crawfish spread out on newspaper on the dinning room table. It was fantastic! I think I gained 5 pounds every summer. It all comes to mind. The picture in my head of Aunt Margaret right now though, of her particularly, is of her standing in the kitchen over the stove, all the ingredients neatly chopped and ready to go, a bright orange GIGANTIC Creuset cooking pot before her--the only type she used-- stirring the roux for the gumbo until it was just the right golden brown, all the while talking in her throaty voice and letting out, every now and then, a laugh that shook her belly and filled the kitchen with something I can only describe as pure joy. She was the first to explain "female things" to me in some understandable way, and the first to hand me a Mason Pearson. "Never Skimp on a hairbrush," she'd say. In truth, Aunt Margaret, was a force of nature walking around the house in a dizzy array of kaleidoscopic mumu's, billowing behind her confident stride, and I can still hear her voice the way she said my name with a amalgam of an accent that resonated Boston, Texas and New Orleans all at the same time-- she'd lived many places and seen many things before settling down with Uncle Al-- a through and through Cajun and ex-policeman in New Orleans-- and learning how to make a proper oyster po-boy. "Ya gotta stop being wild sometime," she once told me about deciding to get married, "And I knew nobody was going to treat me better than your Uncle Al." Funny though, a painting she had of a dancing girl, torso up, full cleavage and a mischievous smile is always one of the things I remember being in her home, even after she moved to Beaumont years later before her death. And I knew there was a story there. Perhaps one she never told, but oft hinted at. A gift, perhaps? A gift...material ones have a meaning only as long as the person alive remembers it, perhaps. But the shadows are still there. I guess that's why I'm writing this. To flesh out my shadows. 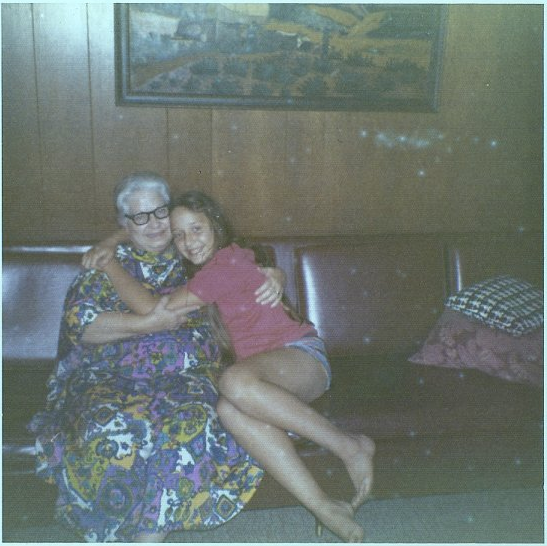 Right before she left, only a few months after my Dad, Aunt Margaret gave me a beautiful Victorian couch with green velvet cushions bought from an antique shop in the French Quarter a lifetime ago. I always feel like it harbors secrets and stories from it's 200 year plus history that it wants to tell, but doesn't know how. But I listen anyway. It sits now with two silver chairs and a painting of the Louisiana swamps, and I cherish them all. Before she died, I was visiting Aunt Margaret one last time. She made my brother Ray and I a huge pot of Gumbo again in the bright orange Creuset pot. For her, good food= love, and I can't deny I think the same thing. "Don't' use anything else but this pot," she'd say. "It won't taste the same." And she was right. It never does. After dinner, she showed me a gown that she planned to be buried in someday. Still in the box, wrapped in tissue paper. "I'm saving it for that special occasion she said. It's too pretty to just wear all the time. And that's what I told your Uncle Al when he gave it to me" she matter-of-factly-explained. "I can't see myself in some pantsuit in the casket, anyway. Just not me." She was a character and unique until the end. And yes, she was buried in the pink lacy gown. But I never really think of her being gone. I remember all of this when I think of Mardi Gras....it was part of my fabric even before I knew what it even was, I guess. Not the drinking and bawdiness of Bourbon Street. I don't give a hoot about that. Something else though. A sense of place. Aunt Margaret often gave me Mardi Gras parade medallions and beads that had been thrown from the floats, and regale me with stories of the krews and the costumes and the parades and the politics.... 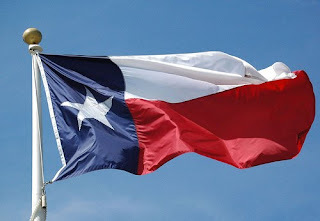 I loved having those colorful mementos and always put them in my little box of treasures--things I collected that made me smile--when I got home to Texas. I'd pull out that box on rainy days, and take each thing out and inspect it closely, I don't know, looking for WHAT, exactly, but they were my cigar box object d'art. And I remember the history of each little thing from the little colored parade discs to the razorback that Uncle Arthur carved out of a peach pit. Years later, when living in NYC, my friends and I decided to pile into a car and drive non-stop to New Orleans to experience Mardi Gras for ourselves. It would be my first time-- after all those years of summering in Louisiana--all those times of making the 10 hour drive with my Dad, Mom and two brothers, didn't make a road trip seem that alien. All those times of studying the various medallions and wondering what it was all about. And, why, miracle of miracles, my friends and I even found a whole Victorian house to rent in the Garden District. What luck?! So we did it too-- Driving for 24 hours straight. I think there were 5 of us. Yeah, yeah...It was one of those things you do when you are in your early 20's: wake up one day and say, "Hey, let's do this," And you just do. Now I know from experience: New Orleans is a CRAZY place for Mardi Gras, especially if you are on Bourbon Street. I think someone threw a lighted cigarette down my shirt from one of the balconies if I remember correctly. BUT, If you want it a little calmer, you can have a wonderfully good time staying off that main drag and hitting places like the Gumbo Shop and any place with live Zydeco music. We love dancing to the Zydeco music! And a side note.... my favorite time to be in New Orleans is actually for Halloween. Wonderful parades without the madness. High energy without too many way too far in-their-cups. The pet parade is an absolute hoot! So, I'm gonna look for both in NYC. And I'll help you too! As my own little public service announcement, here are some places to celebrate Mardi Gras in the Big Apple, since we can't be in the Big Easy today. (In the past I've gone to a place named Philip Marie, where my friend's band had a gig every year. Due to budgeting cuts, that isn't happening this year. Darn it!) But, never fear. 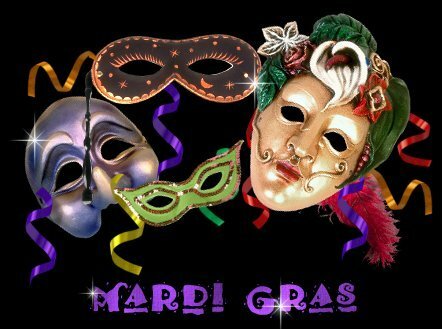 Manhattan - Below 14th St.
Feel free to share this with your friends to help you plan your Mardi Gras festivities. So, whatever you do, have a great Phat Fat Tuesday, ya'll. This day, as on many days, but especially this, I have a bit of my Aunt Margaret in me. And I don't know anything more important to say about a person than that. MInck Oosterveer on "Wheremonstersdwell" radio, March 9th! Hey Ya'll, Minck Oosterveer will be on the radio live tomorrow night, talking to us by the magic of the internet all the way from The Netherlands! Tune in to hear about his career, influences, and the new project "Ruse" with writer Mark Waid! "This week we welcome artist Minck Oosterveer to the program. You've seen Minck's work in books like 'Zombie Tales' and Mark Waid's 'The Unknown' from Boom! studios. He joins us in the Monster Cave© this week to chat about his American work as well as the ton of work he's done in European comics. We'll be chatting with him while he is in his home country, Holland, so it should be interesting." Hi Kids-- While I was at the wonderful Wizard Miami last week, I met a gentleman at the show who has a pretty cool blog pertaining to everything robotic. Micronauts, Rom, ExoSquad, you name it. I was the editor of the short-lived ExoSquad at Topps Comics, which produced some fantastic Michael Golden covers--two of which were sadly never printed-- as a comic cover anyway. 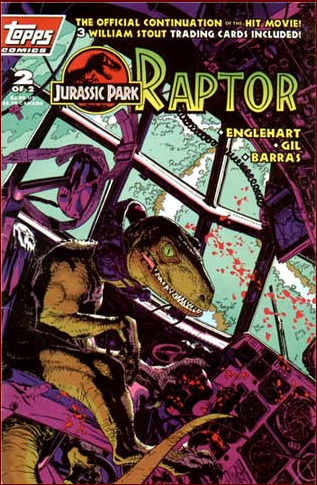 But, nostalgia reigns supreme, and apparently, this comic has a cult following! Who knew! My part of the interview begins around the 16 minute mark after the interviewer, Steve De Anda, does his intro. "The 24th seal of the Roboplastic Apocalypse is pulverized instantly like a Tyrannosaurus getting kicked in the face by Jackie Chan when special guest Renee Witterstaetter demolishes the Kingdom Roboplastico! Join me my fellow Macrocranians as I talk to this prolific writer, author, colorist and editor about her career spanning multiple artistic disciplines and numerous roles within and beyond the comic book industry. Thrill to stories from behind the scenes at Topps Comics during the production of the ill-fated ExoSquad book and other fascinating tales like why the powers that be at Marvel weren't interested in doing a Jurassic Park movie adaptation. It's all here and more in this THE ONLY CELEBRATION OF EXOSQUAD'S 18TH ANNIVERSARY WE'RE GONNA GET edition of the Podcastalypse!" Thanks to Steve for the great conversation! Steampunk Meets Witty Repartee and a Hint of Magic! New York, NY-- It's just been announced that award-winning artist Minck Oosterveer, will once again collaborate with writer Mark Waid on a new story-- this one on the Waid created series, "Ruse" published by Marvel Comics. Originally debuting at CrossGen, "Ruse" quickly became that companies top series, and the property was purchased by Disney when CrossGen was no more. With Marvel now under the Disney umbrella, "Ruse" is having a long awaited revival. Creator Mark Waid describes the series as "A steampunk Sherlock Holmes with romance, witty repartee, and a hint of magic." What better artist for this issue of "Ruse" than Minck Oosterveer, known for bringing all of those elements to his own properties and commercial artwork. In fact, Oosterveer is known world wide for a plethora of comic strips, movie work, and sequential art. Most notably here in the United States for such books as "Zombie Tales" and "The Unknown" also with Waid! The "Nicky Saxx" co-creator is strongly influenced by Milton Caniff, Alex Raymond, and Will Eisner. After working for a studio on productions like 'Tom & Jerry', 'Sesame Street', 'Paddington', 'Ovide' and 'Spider-Man', Minck Oosterveer moved more in the direction of another stylistic forte, working with Willem Ritstier on the series "Claudia Brücken" for the Franco-Belgian publishing-house 'les editons Lombard' and Tintin-Magazine. He will bring all of this experience to "Ruse." "What makes the series so special," according to Oosterveer, "is most of all the interaction between the arrogant detective Simon Archer and his partner Emma Bishop, who he keeps on referring to as 'his assistant'. "The adventurous stories with a bit of mystery and the supernatural," make it a great project to work on-- it's very interesting." As far as the approach the readers can expect, Minck is a big fan of the original series from "CrossGen," and wants to be true to that flavor. Something readers from that first run will certainly love. "With 'Ruse' I will use my more classical style I used when I did the Flash Gordon-like newspaper adventure comic "Zodiak". And although I'll be pencilling and inking, which I'm used to do, hopefully readers will like my approach." Currently, Oosterveer is scheduled for several European and US shows in 2011, with more to follow. Issue #3 of "Ruse" with story by Mark Waid and pencils and inks by Minck Oosterveer is in the works now. Look for Marvel's ordering information on the series and on this particular issue featuring the reunion of these two wonderful creators! With several relatives and friends telling me they are getting pesky March flu symptoms, I wanted to give a hopefully helpful tip about what always seems to do it for me. Traveling as I do, I always keep Oscillococcinum in my kit. I was first turned on to this homeopathic remedy working on film shoots in Los Angeles. A director on a particular commercial was coming down with the flu and wouldn't even go to work until one of the Production Assistants found a drug store that had Oscillococcinum. I had never heard of it before, much less being able to spell it or pronounce it, but we eventually located the stuff, got him medicated and back to work. And I have to say, since then, it's been my stand by miracle flu remedy. 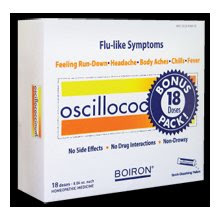 Oscillococcinum works best right when you feel the flu symptoms coming on, but if you take it right away, you won't even get sick. Better yet, it's available over the counter. So that's my tip for the day, and no, I'm not being paid by them (yet). Just want us all to have a healthy March, headed into a beautiful spring. Staying a few days after the Wizard Miami convention for a little fishing in the canals around this part of Florida looking for the elusive Cobra Snakeheads...I didn't find too many fish, BUT the beach near my little apartment in Lauderdale-By-The-Sea, WAS literally COVERED, with what I assumed were jellyfish. They kind of snuck up on me the second day. i.e. not there one day, and having a big party the next. Walking along the shore, shoes off and feet in the surf, the first blue invertebrate creature caught my eye, with a beautiful mauve sail, looking like a deflating, multi-colored, kids birthday balloon. On closer inspection...which of course I am wont to do-- it was NOT. Being a kind-hearted soul and thinking it had a few breaths left in 'em, I gently took the tip of my new sneaker, and tried to nudge the unfortunate critter back into the surf. I certainly wasn't going to touch it. I remember that episode of "Friends." But I did what I could. "Poor Jellyfish," I thought. "Get thee back into the ocean." It seemed more resigned to languish on the beach, however. So, after a few attempts I went on my way. About four hundred feet later, I saw he was NOT alone. Like the jellyfish version of a whale beaching, the coast around Lauderdale-by-the-sea had amassed an armada of blue carbon dioxide jellyfish sails, baking in the sun. It really looked like a Lilliputian fleet of windjammers in dry dock. As I was looking closely--as close as I could without touching it that is-- at one particularly large specimen, a surfer walking by, said, "Hey, don't touch that thing. You'll end up in the hospital. That's a Man O' War." "Isn't it dead," I asked, thinking well, the war is over for these guys. "Doesn't matter," he replied. "The stings still a #*&%$@&!" 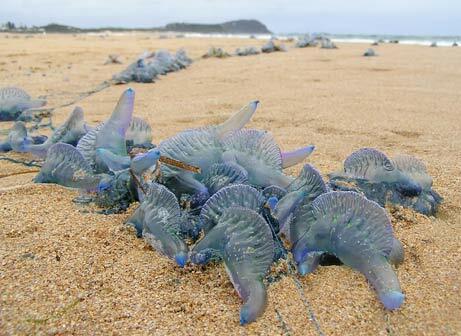 Apparently these organisms---these fallen Portuguese Man O' War-- can reach their tentacles from beyond the grave. Wow! Wouldn't that be fantastic! This was obviously a fact that the normally voracious sea gulls scavenging about seemed to already know. Not even a nibble did they send the Man O' War way. Oh, it also seemed to be a bit of knowledge that the parents letting their toddlers build sandcastles that were dead-venomous-creature adjacent, didn't seem to mind. "Location, location, location, kids!" "Odd scene," came to mind for some reason. The second day on the beach, I fully expected the Man O' Wars to be washed out to sea, but there were even more of the bulbous carbon dioxide creatures strewn about! Didn't they know what was good for them? I noticed once again their oddly compelling beauty, so I decided to do some research of my own. And guess what?! They are NOT jellyfish at all. 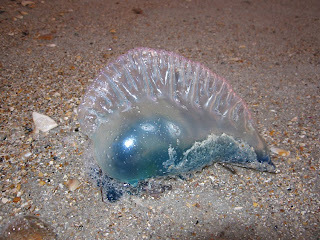 The Portuguese Man-Of-War is something completely different! "Despite its outward appearance, the man-of-war is not a true jellyfish but a siphonophore, which differ from jellyfish in that they are not actually a single creature, but a colonial organism made up of many minute individuals called zooids. Each of these zooids is highly-specialized and, although structurally similar to other solitary animals, are attached to each other and physiologically integrated to the extent that they are incapable of independent survival." 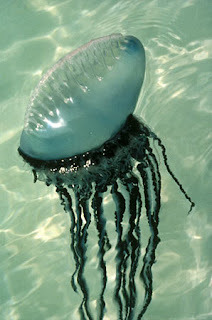 These ancient creatures, named after the Spanish sailing ships nicknamed Man O' War's, have been bonded together in this way without evolution for millions of years, it seems, and as I read further, there are even tiny fish that have become immune to their venom, and live among the tentacles and sometimes even snack on them. A symbiotic relationship as it were-- learning to endure the stings, become desensitized, in order to reap some benefit from the compartmentalized mother ship. "You said Venom!" Well, yes, my surfer dude was right. They are particularly nasty it seems. "The Portuguese Man o' War is responsible for up to 10,000 human stings in Australia each summer, particularly on the east coast, with some others occurring off the coast of South Australia and Western Australia. "The stinging venom-filled nematocysts[ in the tentacles of the Portuguese Man o' War can paralyze small fish and other prey. Detached tentacles and dead specimens (including those that wash up on shore) can sting just as painfully as the live creature in the water, and may remain potent for hours or even days after the death of the creature or the detachment of the tentacle. "Stings usually cause severe pain to humans, leaving whip-like, red welts on the skin that normally last 2 or 3 days after the initial sting, though the pain should subside after about an hour. However, the venom can travel to the lymph nodes and may cause, depending on the amount of venom, a more intense pain. A sting may lead to an allergic reaction. There can also be serious effects, including fever, shock, and interference with heart and lung action. Stings may also cause death,although this is rare." Oh, well, THAT'S a Relief. And no, I was never going to touch one. I figured it was blue and alien looking enough that it probably was not human friendly. Bright Colors=Don't touch, right? "To avoid any further contact with the Portuguese Man o' War." So, armed with knowledge, I still did my jog on the beach the next day, gamely jumping over bulbous Man O'War hurdles, leaving them in my wake, as their little sails bobbed in the strong ocean breeze, decay firmly anchoring them to the white sands. With the coast already teeming that morning, I sat down to rest among the carnage post run-- just me, a throng of sea gulls nipping at seaweed nearby, lifeless beat-red sun-bathers legs akimbo, and a few intrepid surfers still waiting for that one awesome wave to change them from amphibians by choice to landlubbers again. The belly of one particular basking and somewhat basting human punctuated the sky nearby, like a over-ripe plumb, striking a silhouette that mimicked almost perfectly that of the unfortunate ancient, primitively made, Man O' War scattered all around him. This bright red vacationer, in the lime green speedo and the unwilling-dry-docked bright blue invertebrate seemed somewhat akin at that moment--the mix of colors creating one wild watercolor scene. Sitting amidst this kaleidoscope, I wondered, complex and yet simple as it was, surviving generation after generation, why had not this creature ever evolved to be a cohesive unit, instead remaining a fractionalized group, each compartment so separate from the next, yet essential for survival? Or, most important, why had it not evolved to have created self-aware locomotion, movement, for it's wind-swept life, so that it could lead itself out of troubled waters, avoiding beaching, ruin, and an ultimate demise en masse? What a simple thing we take for granted. That free will thing. Being able to change course when needed and avoid the rocky coast. Even though, sadly,more often than not... the choice is to forge ahead. Dam the torpedoes. Somehow... Man O' War seemed an appropriate label at that moment. But then...again...who am I to say... perhaps the humans baking in the sun are quite happy just the way they are. NIck Cardy on "Where Monsters Dwell" Radio, March 2nd! 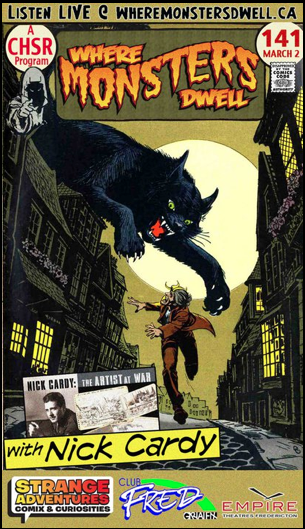 Hi Ya'll-- The fine guys at www.wheremonsterdwell.ca will be interviewing artist Nick Cardy, live, tomorrow night, March 2nd. The shows starts around 9:00 pm. EST, and you can listen to the live stream either on the radio or on their website. Nick will be talking about his influential career in comics, as well as his new book with Eva Ink Artist Group, "Nick Cardy: The Artist at War," focused on Nick's sketches during WWII and his experiences therein. Don't miss this interview with a true living legend in sequential art history. Nick is a wonderful storyteller, not only on the printed page, but in person as well!